Purple, black and pink ribbons near Archer Avenue between Harlem and Narragansett. 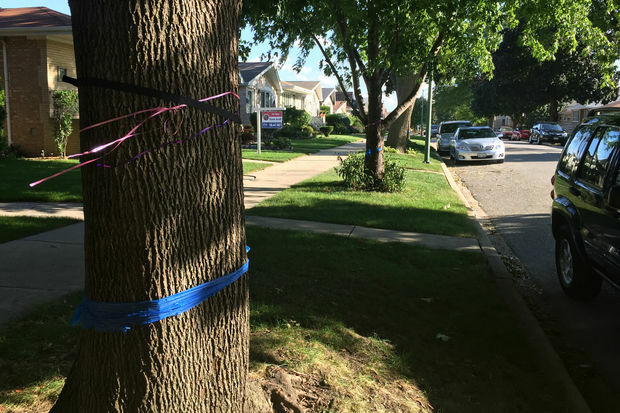 GARFIELD RIDGE — After some controversy over the removal of blue tree ribbons in Garfield Ridge, an area resident decided to make the trees even more colorful: adding purple, black and pink ribbons to the Southwest Side neighborhood's streets. 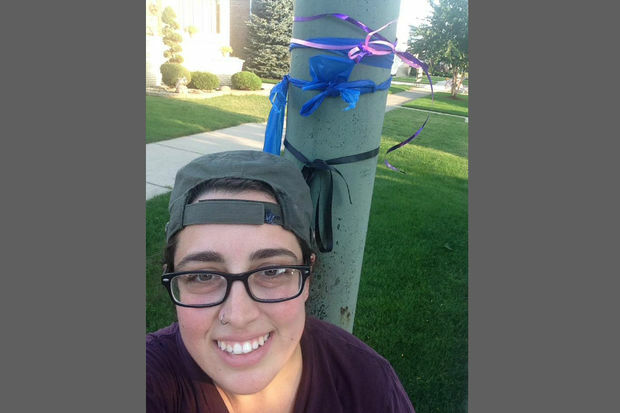 On Labor Day, 28-year-old Jes Scheinpflug, who identifies as a queer woman, and a group of friends walked down Archer Avenue between Harlem and Narragansett tying up the new ribbons. The new batch of ribbons represent people who've been murdered, raped, harassed and silenced because of their gender and race, Scheinpflug said. A graduate student studying social work at Loyola University, Scheinpflug visits her parents in the Garfield Ridge neighborhood, known for its heavy concentration of cops and firefighters. Blue ribbons cover trees and light poles for blocks in the neighborhood, and residents recently came together to support local authorities by putting blue lightbulbs in their porch lights. Though she supports police officers, Scheinpflug said the ribbon campaign supporting cops should include all people. The effort by Scheinpflug's group came in the days after a Chicago Public Schools teacher drew fire for cutting down pro-police blue ribbons in a show of support for the #BlackLivesMatter movement. Scheinpflug said there’s no reason why a community can’t represent all people.